What does GAGC look for in approving an applicant who wants to adopt an ex-racing greyhound? We look for those who have a sincere appreciation for the characteristics of this breed, those willing and able to make a long-term commitment, a willingness to listen, financial stability, and a safe and loving home. We feel the dogs deserve this. What kind of pets do they make? Ex-racers are great companion dogs but they are not right for every home. They’ve been bred and trained to do one thing: run extremely fast. Many other breeds of dogs are bred strictly to be companion animals, therefore the greyhound is qualified as a “special needs dog”. What are these special needs that make greyhounds different? Racing greyhounds have never been in a house, seen a window or a sliding glass door, stairs, TV etc. They may have never seen a child or any other dog, except other greyhounds. These dogs are remarkably adaptable, however, and can learn quickly, but it takes patience and commitment on the part of the new owner to help an ex-racer make the transition from racing machine to family pet. Can my greyhound live outside? No. Greyhounds are strictly indoor dogs and our program will not adopt to anyone who plans to keep the dog outside. Greyhounds have low body fat and no undercoat so they feel the heat and cold the same as humans do. People who maintain “outdoor” dogs and say the greyhound will be indoors are declined by our program. If one dog is outdoors, that is likely where the greyhound will end up. I work long hours. Should I adopt a greyhound? Ask yourself the question is this the time to be adding a dog to your life. It is a lot to expect of a greyhound to wait more than eight hours to relieve himself, something people certainly don’t expect of themselves. What about using a crate with the greyhound? Don’t assume because a greyhound has been kept in a crate at the racing kennel he will accept it. Remember that when he was in a crate at the kennel he was never alone. Your home is a whole new environment for him so the crate should be used in an educated way or not at all. The use of a crate is meant only for the initial adjustment to a home environment. Where a crate is used, it must be introduced in a slow and gentle manner and NEVER as punishment and long confinement. As your new greyhound adjusts, you can begin to wean him from it. If you are approved for greyhound adoption, your GAGC adoption representative will give you additional information on the correct way to use a crate. How do ex-racing greyhoundsdo with kids? Some are tolerant of children but a greyhound is not a dog a child can particularly “play with” or interact with. They are not a rough and tumble kind of dog. 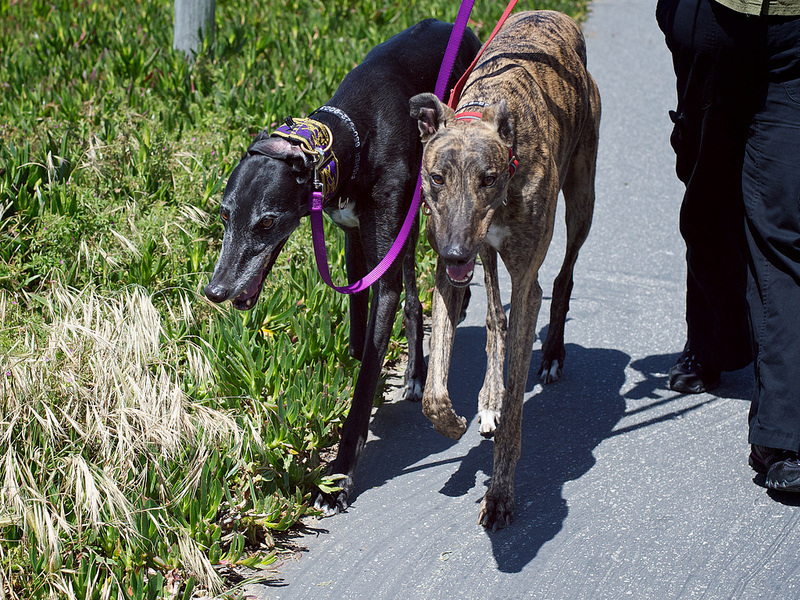 There are other breeds that are better suited for play partners than the ex-racing greyhound. They are large, athletic sprinters and no one under the age of 14 should take these dogs for a walk without an accompanying adult. Younger children may also not understand how important it is to the greyhound’s safety to shut gates and doors to the outside. 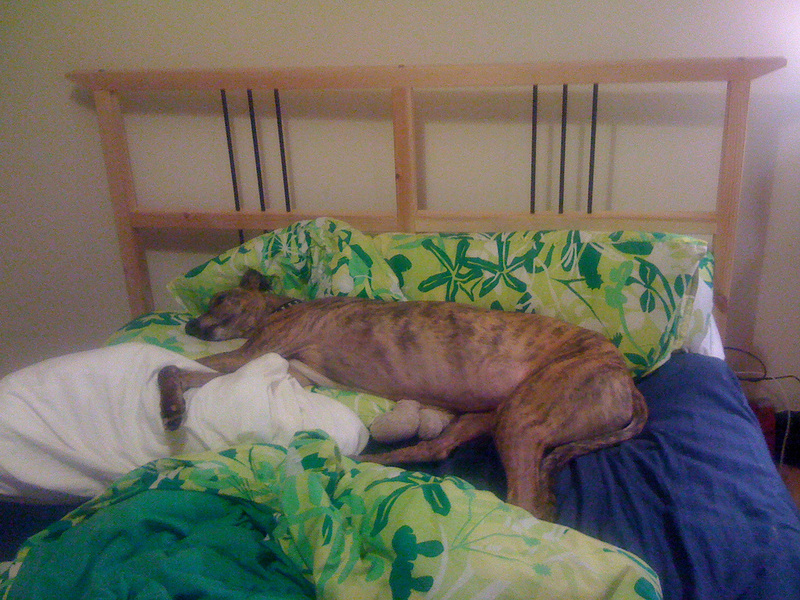 It is also VERY IMPORTANT that they respect an ex-racer’s sense of “space”. No, they’re not, but they are fairly easy to housebreak since they are kennel trained and it shouldn’t be a problem. How are they with cats, small dogs, and other small animals? We try very hard to match the right dog with the right family. When requesting a dog we tell them the environment that the greyhound will be going into and ask that the greyhound will be suitable to insure the safety of the other household pets, for example that he/she has been cat tested. However, small animals, such as chinchillas and rabbits, look a lot like a racing lure and can be a challenge. We value those animals that are already living in the household. Please remember that a greyhound that is cat-tested and determined to be OK means for indoor purposes, and will not likely be safe with cats or other small animals outside the home. Our adoption fee is $250. This partially defrays our cost of spaying or neutering the dog, getting dental work done, heartworm tests, and vaccinations. Keep in mind that owning a pet carries a financial responsibility that will last the dog’s lifetime. The adoption fee is considered a donation. Are there any good books I might read to prepare me for greyhound adoption?